Caring for your pet's dental needs is every bit as important as the rest of their body. Contact Ashworth Road Animal Hospital if you live in the West Des Moines, Windsor Heights, Urbandale, or Clive areas to make an appointment with one of our veterinarians for a dental exam each year or when oral care is needed. Here are some frequently asked questions regarding Pet Dental practices that answer the reasons as to why it is important to have them performed and what can be expected from a routine dental exam. If teeth cleaning procedures are not done for your pet, there is always the chance of a bacterial infection, loss of teeth, or pain in the mouth causing your pet distress. Failure to care for your pet's teeth will lead to the presence of plaque on the teeth. If this plaque is not removed with teeth cleaning methods, it will turn into tartar. The bacteria that cause tartar can lead to gingivitis or periodontal disease, which in turn leads to the possibility of pain and tooth loss. There are a few steps that can be taken at home to help keep your pet's teeth clean. Invest in a pet toothbrush and toothpaste and use it daily to help remove debris from the surfaces of the teeth. 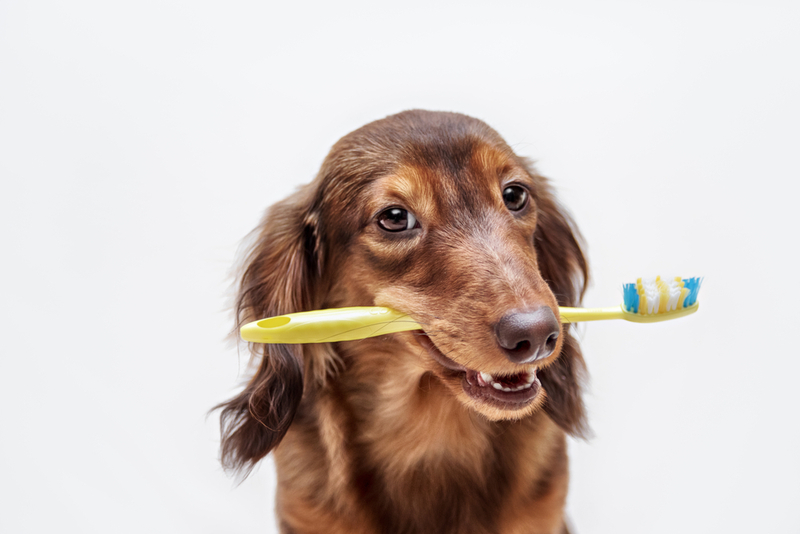 If your pet is not used to this process, consider using a finger brush and do the process at a time you are petting your dog or cat so they are in a relaxed mood when trying to tend to their teeth. Purchase Veterinary Oral Health Council-approved treats to feed to your pet that has tartar control properties to remove plaque before it has a chance to harden. When you bring your dog or cat to see one of our veterinarians, they will first be evaluated to determine if there are any infections, loose teeth or problems in the mouth that require intervention. Anesthesia is used to help keep your pet comfortable during the cleaning process. Our vet will use ultrasonic cleaning tools to remove plaque and tartar from the surfaces of your pet's teeth. Another examination is conducted after the cleaning process is completed to check for problematic spots that require help to remedy them. Digital dental x-rays are frequently needed to evaluate teeth and jaw bone structures beneath the gum tissue. If you live in the West Des Moines, Windsor Heights, Urbandale, or Clive areas, and you wish to have your pet's teeth assessed and cleaned, contact Ashworth Road Animal Hospital to make an appointment. Call (515) 225-1807 today to start the process of obtaining professional Pet Dental care for your pet today.